I realized that for the past month that I've been spending way too much money on food. With the frequent take-outs from Sbarro in the nearby SM mall and the almost-nightly deliveries for pizza and giant burgers (and the frequent trips to Starbucks and Seattle's Best for coffee breaks in between work) being the main culprits. So last Saturday, to conserve my dwindling cash-on-hand, I attempted to cook a meal that would last me the whole weekend. I just basically grabbed whatever I saw on our kitchen cabinet and mixed them all up, and I came up with a dish I would like to christen Mackerel with Garlic Mushrooms in Tomato-Teriyaki Sauce. I think I'm Top Chef material. It still tasted good though. I've just posted pics from our trip to Cambodia here and here. 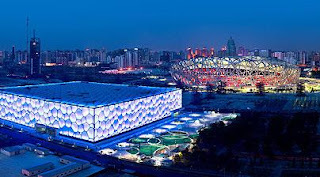 The Bird's Nest and the Water Cube are awesome structures too. Great architecture (especially the Water Cube), and definitely iconic. I wish Manila had a great iconic structure too, just as Beijing has their Olympic sites and KL has the Petronas Twin Towers.